Unity Poker is bringing non-profits a new and exciting way to revolutionize donor acquisition and strengthen donor relationships in a fun and interactive environment. To accomplish this, Unity Poker will host private, on-line poker tournaments for your organization’s constituents on an agreed upon date and time. Unity Poker will help your development team determine tournament registration fees for players. All tournament marketing, e-mail blasts, social media posts and registration will be provided by Unity Poker. This is an ideal way for your organization to acquire new donors with a ZERO DOLLAR out of pocket cost. Poker tables will be branded with your organization’s logo, and a chat box on the tournament screen will allow all players to communicate with each other throughout the tournament. Unity poker is partnered with an established on-line gaming company with years of experience running on-line poker tournaments. Prizes for the tournament will be provided by the non-profit organization and cannot be cash. 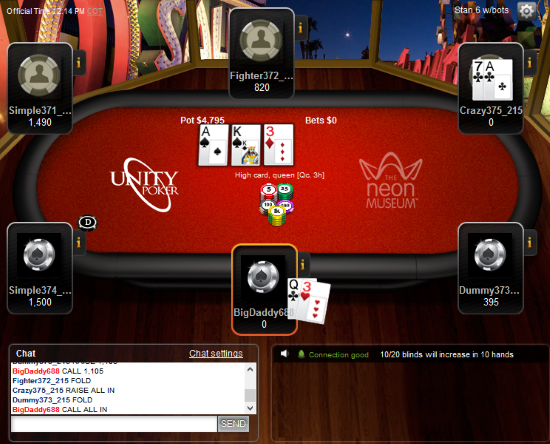 Unity Poker will help you determine prizes and how to distribute them among tournament winners. Once the tournament is complete, players will have the opportunity to sign up for a subscription to the public Unity Poker on-line gaming site, which enables them to play anytime, from anywhere. A percentage of their monthly subscription fee will go back to YOU! This will allow your constituents to continue playing at their leisure while supporting your organization.